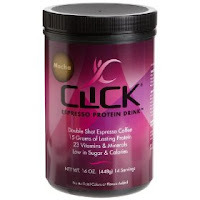 Fellow Click drinkers: Just wanted to give you a heads up that Amazon's Friday Sale has Click at a super low price of $18 a tub and free shipping on orders of $25. To make up the $25 may I suggest pre-ordering their new Vanilla flavor that will be released in March. I was lucky enough to sample it and it is terrific. Hurry though this is a one day sale. Thanks, I ordered my CLICK! Amazon doesn't ship to Hawaii, so I had it shipped to my uncle's in WA so I can get it from him next month when I visit and have some yummy stiff to keep me going on this trip. Thank you for finding this awesome tasting product. Until then my Nescafe or Starbucks VIA will have to fill in. Have a great weekend! I have been without my beloved Click for about 2 months. So I finally, thanks to the heads-up, ordered last night...AND pre-ordered the vanilla! I do hope it's as delightful as the chocolate. Shelley, you have sampled this, right? The verdict? p.s....Click ice cream is in my near future! Oh that is a great idea Cynthia. Wow I had no idea they don;t ship to Hawaii. That's lame. US company. Hawaii = US. Sending you good vibes all is well with the tsunami warnings. Be safe! Di, Yes I was lucky enough to score a sample and OMG its better than any Frappucinos from Starbucks and good for you. I think Vanilla is my favorite.